Vow Of Justice is a tale that ran as a backup feature in issues four through six of Dark Horse’s ongoing Star Wars comic, later retitled Star Wars: Republic. 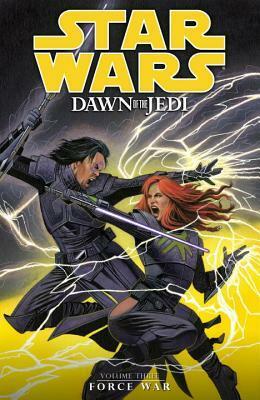 It was included in the trade paperback collection Prelude To Rebellion, and was reprinted in Star Wars Omnibus: Rise Of The Sith. This story features a much younger version of Ki-Adi-Mundi as a recently-knighted Jedi returning to his home planet of Cerea for the first time to end the reign of a local warlord who had terrorized the region before Ki-Adi-Mundi’s departure for the Jedi Temple. What he finds on arrival, though, is not what he expected….Can the newly minted Jedi Knight hold true to the Jedi ways, or will he allow the Dark Side a foothold by taking vengeance on the raiders for their persecution of his family? This shorter tale isn’t as problematic as the main story, even if it is fairly predictable in its conclusion. Definitely worth tracking down, especially if you’re a fan of Ki-Adi-Mundi. This story is set thirty-five years before The Phantom Menace, or sixty-seven years before A New Hope. CONTENT: Mild violence. Mild profanity. Mild sexual innuendo, including a few scantily-clad characters. Continuing my trek through some of the earlier Star Wars comics, we come to Dark Horse’s first ongoing series set in a Galaxy Far, Far Away. Originally simply entitled Star Wars, the series was retitled Star Wars: Republic to avoid confusion when Dark Horse began publishing a second ongoing focused in the era of the Original Trilogy films. For simplicity’s sake, I’m going to refer to the series as a whole using the Republic subtitle in these reviews. 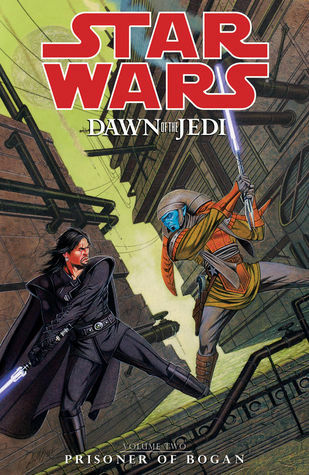 This story was reprinted in the eponymous trade paperback, which also featured the backup tale Vow Of Justice, and in Star Wars Omnibus: Rise Of The Sith. Jedi Knight Ki-Adi-Mundi serves as the Jedi protector for his homeworld of Cerea, a relatively primitive world far from the beaten path of interstellar travel. Cerea isn’t a member of the galaxy-wide Republic, but there are those who would very much like to change that–open up Cerea as a market for modern technology and exploit its unique natural resources. When violence breaks out at a pro-Republic rally and his daughter is implicated, Ki-Adi-Mundi is sucked into an investigation of smuggling, murder, and conspiracy…. This one was pretty mediocre, and doesn’t fit very well with the other stories in the same era. Partially this is a function of this story being the first published in this era, even before The Phantom Menace. When this was released, it wasn’t known that Jedi were not allowed to marry. Later the writers were forced to retcon the backstory and explain that Ki-Adi-Mundi was granted an exception to this rule based on his species’ low birth rate. While we know the Republic was growing corrupt in its final days, here it appears downright villainous. I don’t want to say that this was bad, but it wasn’t great–especially compared with some of the later arcs of the same series. This tale is set one year prior to the events of The Phantom Menace, and occurs simultaneously with Jedi Council: Acts Of War. CONTENT: Mild violence. Mild profanity. Mild sexual innuendo, including a couple scantily-clad women in Jabba’s court. Not going to lie, I am insanely excited for the new Battlefront game. Nevertheless, video game tie-ins are always a touchy proposition. For every Halo: The Fall Of Reach there are a dozen that don’t work nearly as well. This one? This one manages to be not only a great tie-in, not only a great Star Wars novel, but a surprisingly solid military novel in general. 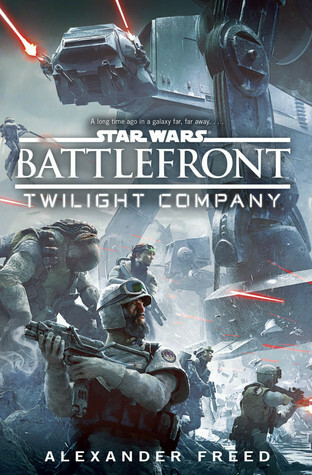 In a galaxy torn by war, few have seen more death and destruction than the troops of Twilight Company. Every time there’s a dirty, dangerous job to do, it seems Twilight draws the short straw. Twilight has its fair share of ideologues, same as any unit in the Rebellion, but that’s not Sergeant Hazram Namir. Namir doesn’t fight because he believes in the Rebellion, he’s not even sure he believes the Rebellion is fundamentally different from the Empire. Namir joined Twilight because fighting was all he’d ever known, and the Rebellion was as good a cause as any. Now he fights for his brothers in arms, his adopted family. Lately, however, Namir can’t shake the feeling that Twilight deserves better than he can give it…. This is not your average Star Wars novel. Instead of mythic heroes waving lightsabers in the face of capital-E Evil, Alexander Freed offers up a tale of ordinary men and women wrestling with that age-old question that eventually occurs to every soldier: just what is worth fighting—and dying—for? The result is a remarkably mature and nuanced entry into a franchise more often known for stark moral divides. The bodycount is high, which on the one hand accurately reflects the game it’s hyping, but on the other hand is odd for a Star Wars novel. Like I said, though, this is far from a typical Star Wars novel. This is a gritty, bloodstained war story that has more in common with Saving Private Ryan than it does the mythic tones of most Star Wars stories. At the same time, though, this is still pure Star Wars. It’s just that here we take the spotlight off of the more mythic characters and focus on the ordinary men, women and aliens living and dying around them in the background. If you’re after a light, cheerful read in which Good triumphs over Evil with only minor setbacks, you should look elsewhere. Bottom line: If you’re more interested in an examination of the cost of war on those who fight and die in the mud, then this is well worth the cost of admission. CONTENT: Strong violence, occasionally gruesome, and with a massive bodycount that includes a not insignificant number of the named protagonists. Mild profanity. Mild sexual innuendo. Here we go again, diving one last time into the ancient history of the Star Wars universe. Obviously, this will contain spoilers for the previous volumes of the series, Force Storm and Prisoner Of Bogan. Jumping forward a year from where we left our heroes, we find the Tython system embroiled in full-scale war. The Rakata have arrived in force, capturing several of the outlying planets before being turned back by the combined forces of the Je’daii and the other Tythans under the command of Daegan Lok. Wielding Forcesabers modeled on that carried by former Force Hound Xesh, the Je’daii walk a fine line in the Force, drawing increasingly on the Dark Side to power their weapons and carry them through battle unscathed. Despite the endless battles facing him and his friends, Xesh is finding himself increasingly in balance as he learns to touch the Light Side of the Force as well as the Dark, helped in no small measure by his growing relationship with Shae Koda. Fighting together the Tythans have managed to stymie the Rakatan advance, but at heavy cost. What they don’t know, however, is that the Rakata want far more than just Tython. They want the Infinity Gate buried beneath it, an ancient piece of tech that would unlock any and every world in the galaxy for conquest…. As with the previous entries, I absolutely loved this one. The one-year jump forward glossed over a number of events that I would have enjoyed getting to see, but given the timing of the license shifting to Marvel, I suspect that this was the only way to get to the conclusion Ostrander & Duursema envisioned before running out of time. I’d love to have a lot more of this series, obviously, but given that events didn’t allow that to happen, this was an incredible conclusion to the series. I would enjoy seeing how the Je’daii evolve into the order we see at the start of the Tales Of The Jedi comics, but that is naught but a pipe dream now that all the relevant media has been relegated to Legends status. CONTENT: Some violence. Mildly explicit sexual content. Mild to no profanity. Once again, here’s a short comic from the Star Wars Rebels magazine! This time we focus on Imperial Security Bureau agent Kallus. As with previous comics, this was originally published in Germany before being translated and published in the UK in Star Wars Rebels Magazine #4. I believe it’s slated for stateside publication, but I’ve no confirmation of that yet. It’s not often we get to root for Agent Kallus, but this story offers you that opportunity and allows a deeper insight into his character. He’s still a cruel and prejudiced officer, still the man that oversaw the extermination of the Lasat, but here we see he’s also a true believer in the Empire as a force for order in a chaotic galaxy. There are Imperial officers who are corrupt and out for their own personal gain, but Kallus will do whatever is necessary to bring such men to Imperial justice. I liked this one. It’s always a pleasure to see the Galaxy Far, Far Away become more nuanced, to get to root for the villains against even worse baddies on occasion. There’s not necessarily a lot here, but what there is suggests a rich history for all characters involved–one I hope we get to explore some other time. As usual, Fisher writes the characters spot-on so that you can almost hear their voices in your head, and Molesworth’s art is better than could realistically be expected from such a publication. CONTENT: Mild violence. No profanity. No sexual content. Continuing my project to work through the backlog of Star Wars comics I’ve yet to read (or haven’t read for a long time,) we jump once more into the ancient history of the Galaxy Far, Far Away….You may recall my review of the first volume way back when, but here’s a quick recap. Over twenty thousand years before the rise of the Empire, the Je’daii and their descendants inhabit the Tython system. Instead of the polarized Light and Dark alignments seen in later eras of the timeline, the Je’daii strive for balance in all things. When the Force is out of balance, the planet itself rises against its inhabitants. Elsewhere in the galaxy, the Rakatan Infinite Empire spreads across the stars fueled by the Dark Side of the Force, finding worlds rich in the Force and stripping them for their own use. Their Force-sensitive hunters have seen a vision of Tython, and Force H0und Xesh was dispatched to find this world and guide his masters there. Xesh’s craft inexplicably crashed on arrival, killing all but the Hound himself and triggering a massive Force Storm. Now with his memories clouded by amnesia but still immersed in darkness, Xesh has been banished to Bogan until he can find balance in the Force. Also on Bogan is Daegan Lok, a mad Je’daii obsessed with a vision of invading armies carrying blades of energy and strengthened by the Dark Side of the Force. In Xesh, Lok sees proof of his vision’s veracity. The council won’t see reason, so he’s going to have to force them to take him seriously….even if he has to conquer Tython to do it! Again, the team of Ostrander and Duursema is one of my absolute favorite in comics. I will read anything with their names on it, and have never yet been disappointed. This series is no different. Everything is fresh and different, yet you can see the future looming over the (distant) horizon at times. It’s fun to see some meat fleshed out on the bones of Star Wars‘s prehistory we’ve been given glimpses of before–the Rakata, the Kwa, etc. The similarities to other eras are fun, but even more interesting are the differences. The Je’daii are just as worried about being too in tune with the light as they are the dark, and if it takes channeling some anger to ignite a Forcesaber, well, they really want that energy blade to work. It’ll be interesting to see how this all wraps up next volume, as I suspect that the vision for this series was cut short by the impending move to Marvel. There were a few minor inconsistencies though. It was implied early on that only certain species were visited by each Tho Yor, and that there were a limited number of these ancient vessels. This volume, we have members of other species in the Tythan system. Not a problem, per se, but how? Also, Hawk Ryo seems a bit ambivalent on what he saw in the Rift. At times he admits to sharing Lok’s vision, then other times denies it with a passion. A relic of a rewrite forced by the impending loss of their license? Maybe. Without giving spoilers, the first scene here with Trill and her Rakatan boss is inconsistent with the revelation near the end of the book. Again, I suspect a shift in direction mid-series to accommodate the shorter run. CONTENT: Some violence. Mild profanity. Mild sexual innuendo, including scantily clad females of various (mostly humanoid) species. Here’s another Star Wars: Rebels short comic! Why? Because I can, that’s why. This particular story first appeared in Germany, was translated and published in the UK in Star Wars Rebels Magazine #1, then reprinted stateside in the US version of the same magazine. After a particularly nasty encounter with Imperial forces the Ghost is in need of repairs, forcing the crew to visit Osisis Station to acquire parts from Galus Vez, the owner of the station. Unfortunately, Vez is tired of dodging Imperial interest in our protagonists, and offers them an ultimatum: beat him on his private course through the asteroid belt, or he’ll take their ship and hand them over to the Empire. Not ideal, but since Vez has no intention of playing fair our protagonists don’t feel the need to either…. This one was fun. The ending is never really in doubt, but you can’t expect too high of stakes in a twelve-page tie-in to a series. They’re hardly going to do something drastic like kill a character or destroy their ship offscreen. The writing is spot-on, and all the characters are true to their on-screen personas. The art was decent, simple and clean without doing anything spectacular. Nothing special compared to comics from the larger publishers, but compared to other shorts like this, it shines. It matches the look of the show well enough, and that’s really all you can ask of it.